On New Year's Eve 1972, following eighteen magnificent seasons in the major leagues, Roberto Clemente died a hero's death, killed in a plane crash as he attempted to deliver food and medical supplies to Nicaragua after a devastating earthquake. David Maraniss now brings the great baseball player brilliantly back to life in Clemente: The Passion and Grace of Baseball's Last Hero, a book destined to become a modern classic. Much like his acclaimed biography of Vince Lombardi, When Pride Still Mattered, Maraniss uses his narrative sweep and meticulous detail to capture the myth and a real man. Anyone who saw Clemente, as he played with a beautiful fury, will never forget him. He was a work of art in a game too often defined by statistics. During his career with the Pittsburgh Pirates, he won four batting titles and led his team to championships in 1960 and 1971, getting a hit in all fourteen World Series games in which he played. His career ended with three-thousand hits, the magical three-thousandth coming in his final at-bat, and he and the immortal Lou Gehrig are the only players to have the five-year waiting period waived so they could be enshrined in the Hall of Fame immediately after their deaths. 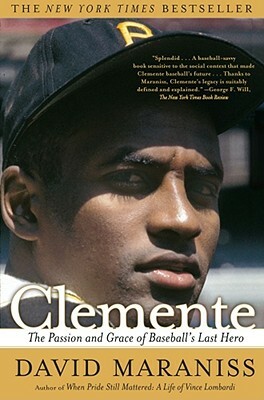 "Splendid . . . . A baseball-savvy book sensitive to the social context that made Clemente baseball's future . . . . Thanks to Maraniss, Clemente's legacy is suitably defined and explained." "Clemente stands apart. His story, like the game he played, is a deep breath of fresh spring air." "Maraniss brings imagination, energy, and even poetry to his superb biography of one of the greatest ballplayers ever to delight a stadium full of fans."